Scour flea markets and resale stores for unique, creative (and inexpensive!) items for your baby’s nursery. 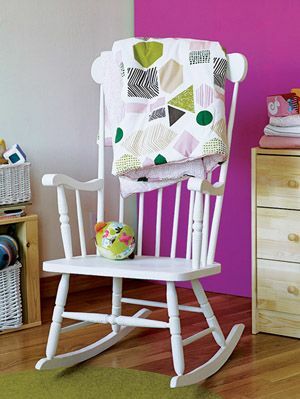 A simple rocker or glider can easily be found with a little hunting. A favorite color can also be your starting point. 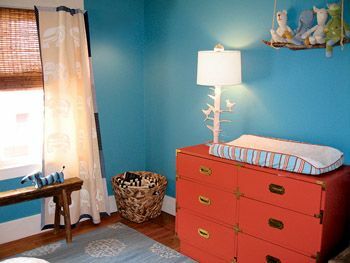 The co-founder of Serena & Lily design studio searched for a dresser/changing table that would provide some pizzazz and found a low six-drawer dresser from the 1950s on eBay. She loved the mid-century modern style, with aged brass Campaign-style hardware. “I decided the room needed a little orange to give it the pop I was looking for,” Dugan says. 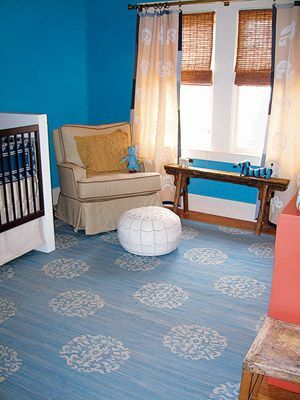 The lines of the crib can set the style for the whole room. A boxy modern design pairs well with a sleek upholstered glider. Incorporate a soft rug and flowing curtains to balance out the angles. Netto Collection Moderne Crib, $1,595, nettocollection.com. Ashbury Glider, $1,199, serenaandlily.com. Start with one thing you love, and use it as inspiration for the look of the room, click here.